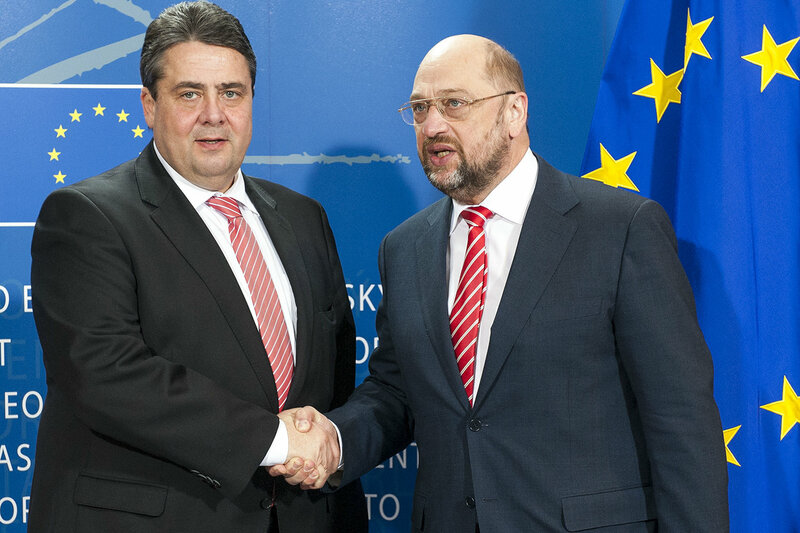 In the run-up to the EU elections, Germany’s social democrats fear for European democracy: Vice Chancellor Sigmar Gabriel suspects “back room deals” on the Commission presidency nomination, while Martin Schulz is afraid Neo-Nazis could move into the European Parliament. EURACTIV Germany reports. “I want to warn everyone against toying with the idea – now or after the elections – over proposing a different person than the top candidates from European political groups for the office of the Commission presidency,” Federal Minister of Economic Affairs and Vice Chancellor Sigmar Gabriel explained on Monday (5 May) in Berlin. Three weeks before the European elections, he is warning against Commission presidency candidates pulled out of a hat following the results. “That would destroy European democracy” and would be “the biggest act of dumbing down the people in the history of the European Union,” said the head of Germany’s Social Democratic Party (SPD). “Then we can cancel the next European elections,” Gabriel said. For the first time, European political parties have chosen top candidates to vie for the next European Commission presidency. The 28 heads of state and government in the European Council must take the election results into account when selecting a candidate. After the proposal is made, the candidate must also be confirmed in the European Parliament with an absolute majority. Gabriel said he had noticed “considerations from sources of the European Council” to propose a different applicant for the Commission presidency – other than the one nominated in the European elections. He also said he was not yet able to reach any arrangement with centre-right Chancellor Angela Merkel. But the Chancellor is smart enough, he said, to know that majority approval is needed from the Parliament. “The candidate who receives a majority in the Parliament shall become Commission president,” said Gabriel. If Schulz wins over a majority of the votes in the European Parliament after the European elections, he said he wants to become head of the Commission. “I want to win back the citizens’ lost trust in the EU,” said Schulz. If he becomes the next Commission president, Schulz intends to focus on fighting youth unemployment. To do so, he wants to bundle forces in the Commission and create a special “industry and economic committee” within the EU executive. The SPD politician also hopes to markedly increase the EU’s investment quota and further develop the European Investment Bank (EIB) into a European Growth Bank. “Companies that want to employ young people should receive special support in interest rates and loan periods,” Schulz said. Harder line against Google & Co. The PES top candidate also encourages greater responsibility from big companies like Google or Amazon. Meanwhile, he wants to implement stricter anti-trust measures on the digital market. In this way, he said, he hopes to increase competition. At the same time, he wants to invest more in the expansion of digital infrastructure. “It cannot be that Europeans completely miss out on the digital future,” said Schulz. Schulz wants to fight tax fraud and fiscal dumping, due to which €150 billion escapes public budgets each year. Further, Schulz said he sees the planned Transatlantic Trade and Investment Partnership (TTIP) between the EU and the United States as “useful” and wants to declare it a priority. “TTIP should not be allowed to undermine social standards, data protection rules and environmental protection”, the social democrat indicated. Under his direction, he said, the next Commission should be accompanied by an advisory group consisting of relevant civil society groups, experts and unions. “Whoever wants to win trust must make the contents of negotiations public”, said Schulz. German Economic Affairs Minister Gabriel also advocated for more transparency in the negotiations and greater say for national parliaments. In this way, the agreement would also require approval from the German Bundestag, Gabriel indicated. In light of the European elections, Schulz expressed the concern that right-wing extremists could move into the European Parliament with the absence of the 3% threshold. According to current surveys, up to two representatives of the far-right National Democratic Party of Germany (NPD) could win seats in the European Parliament following this month’s elections. “There is a real danger, that people propagating Adolf Hitler’s ideology could spread their hate in the European Parliament. I do not want these people to smear Germany’s name in the Parliament,” Schulz said, “that is why every single vote is important”. Gabriel said he hopes Schulz’s nationality will mobilise voters in Germany. “I hope that many people in Germany will seize the opportunity to vote for a German as Commission president,” the Vice Chancellor said. Schulz himself rejects a double campaign strategy, emphasising his German nationality in his home country while down playing it in other Member States. The European elections will be held in all EU countries in May 2014. The Lisbon Treaty states that the European Parliament shall elect the commission president on the basis of a proposal made by the European Council, taking into account the European elections (Article 17, Paragraph 7 of the TEU). This will apply for the first time in the 2014 elections. Ha not real democracy then. Oh, pur-leez. The European parliament does NOT represent the European people more than their national governments do. The Lisbon treaty states that the European Council (i.e. the national governments) select the Commission president, and they only need to take the European parliament results into consideration, not base their choice on them. The biggest backroom deal would be twisting these elections to foist Schulz upon us – the most unsuitable person for Commission president imaginable. The greatest embarrasment for Germany would be if Schulz was somehow imposed on us and he would do such an appalling and horrific job Europeans would wonder why Germans are famed for being efficient. The only thing Schulz is efficient at is climbing his way up the greasy pole of power through networking and making “friends” – his actual political experience is minimal.